Mumbai: If you have to head to Nariman Point every morning, think of another route. With only one lane along Marine Drive open for vehicular traffic every morning till January 26, driving on the stretch is going to be a nightmare. Some terrible commutes lie ahead this week for motorists and students who have to head to Churchgate or Nariman Point every morning. With the state government's decision to hold the Republic Day parade at Marine Drive this year on the lines of Delhi's Rajpath, parade practice every morning on the roads in the vicinity has been giving grief to regular motorists and school-going children. The Mumbai Police, Armed Forces and children representing various schools are taking part in the rehearsals. The rehearsals started yesterday and will be continuing till the day of the event. Practice will start at 6 am every morning and continue till noon. On the very first day, students reached their schools at 11 am because of the traffic situation, instead of the usual reporting time of 9.30 am. Office-goers also reached their workplaces painfully late. Parade rehearsals occupied three lanes along the entire stretch of the Queen's necklace, with only one lane on the extreme right being left open for traffic - utterly insufficient at peak hours, with traffic heading towards the business district of Nariman Point. To add to the motorists' woes, roads in the vicinity have been dug up recently. The traffic police have also prohibited parking on certain roads and shut down other lanes to traffic. An aggrieved parent said, "My children go to school by carpool and left home at 8.30 am. They reached BD Somani International School at 11 am. The school excused them today. I left at 9 am for work from Napean Sea Road to my office at Marine Chambers on Marine Lines, and reached at 11.45 am. What would have happened if someone was dying and wanted to reach the hospital? It is inhuman to close such roads at peak hours." Taking note of the mayhem unleashed on the roads yesterday, the Mumbai Traffic Police made changes in the rehearsal schedule of practice for the next two days. "The parade would begin from Air India building and reach the NCPA for the next two days. 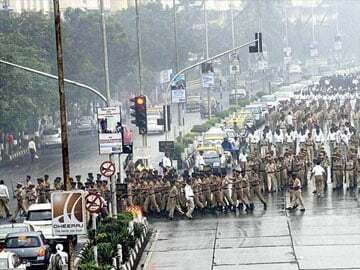 On January 24, the parade will march on the actual stretch," said S Nilewad, DCP (South), Mumbai Traffic Police. Netaji Subhash Chandra Bose Road (Marine Drive) will have one lane operational till January 26, from Air India building to Girgaum Chowpatty. However, vehicles can use Maharshi Karve Marg (Queens Road) between the Opera House and Churchgate, where there are no traffic issues connected to this parade. Some residents, however, said that they were happy that Marine Drive was hosting the parade, traffic issues notwithstanding. "After all, this parade is being rehearsed to celebrate our nation's pride, so a bit of inconvenience should be borne," said A Rao, a resident of Marine Drive. On January 26, Marine Drive and several other roads that branch out from it will remain closed from 4 am to 2 pm. The roads near Marine Drive are shut because of the parade practice, so it's alright. We just need good management, and we are good to go. - Anil Bhatia, secretary, MDRA.